This is the PERFECT thing to eat on days like today in Louisiana! After making the REAL Watermelon Jell-O a few weeks ago, I still had leftover watermelon in the fridge. 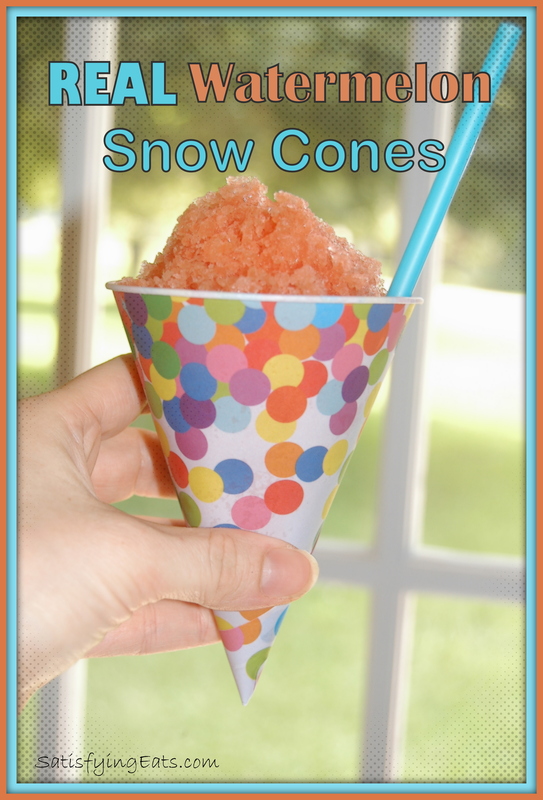 Last year I bought a cheap snow cone maker and paper cones to experiment with making a substitute to the sugar laden syrup you purchase at the store or get at the corner stand. My first thought was to reduce watermelon juice down, then I could use it to pour over a snow cone. Long story short, bad idea. The blended pulp reduced into this thick sludge, scratch that idea! So how can I get the real watermelon flavor??? Hmmmm. 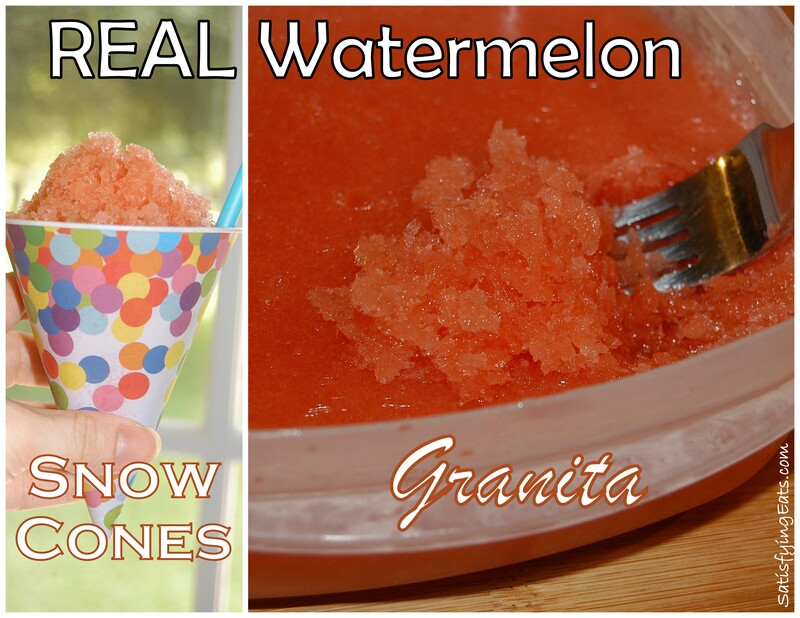 This REAL Watermelon Snow Cone is SO much easier!!! NO syrup or ice needed!! And NO artificial colors or high fructose corn syrup! Just REAL Watermelon! And they light, cool and so refreshing! The key to this recipe is using a little alcohol, preferably vodka. The small amount of alcohol ensures that the frozen watermelon juice doesn’t turn to one solid piece of ice!! I don’t drink but I find myself using everything from wine, beer and now vodka in many of my recipes! Use whatever fresh juice or juice combo you have on hand for unique snow ball creations. Substituting lime juice instead of lemon taste great. Blend a few leaves of basil in with the watermelon juice for a nice twist. If using a sweetener, you may need to heat the juice just slightly so it will dissolve. If not using vodka, partially thaw before scraping snow with a fork. Add a little thick coconut milk or cream to an added treat. Add lemon juice and vodka to watermelon juice. Taste for sweetness and adjust if necessary. Pour into a 4 cup freezer safe container (shallow is best). Freeze for 6 hours or overnight. After frozen, remove from freezer and use fork to scrape “snow” and enjoy! Serve in a small bowl or in paper cones. Glad you enjoyed it Peg! Yeah, it’s a great way to use up watermelon in fridge! 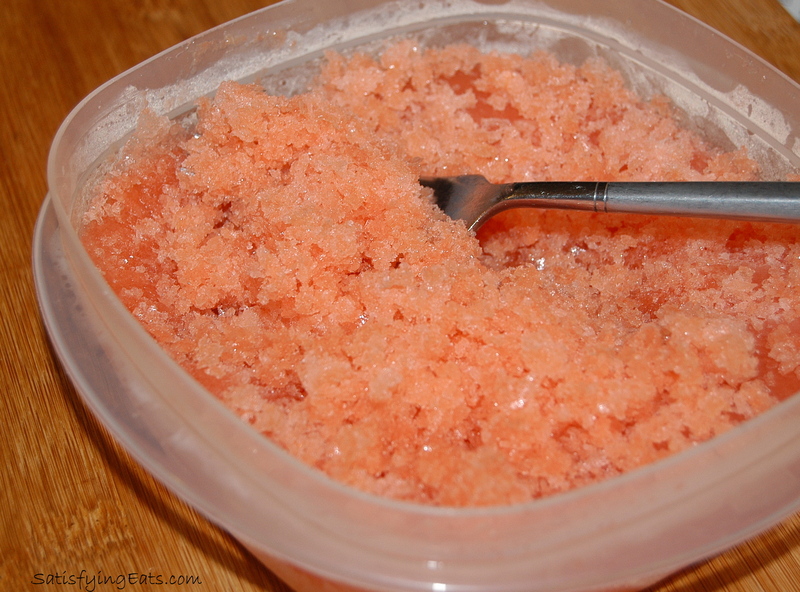 I just bought another one just to make this granita for the freezer!! It freezes well!